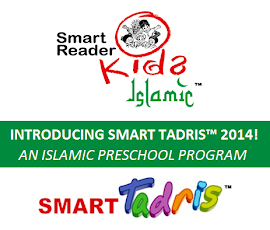 The Smart Reader® English Programme is specially designed for children as young as newborn. It comes in 10 comprehensive levels that can be continued until the children enter their Primary School Years - Standard 1 to 6 (UPSR). A great number of kindergartens throughout West and East Malaysia have adopted this programme with great success. It also has received support from Philippines, Thailand, Brunei, Taiwan, India and New Zealand. It's the answer for your children needs in learning the English language. With the tagline – “Simple and Fun”, the program applies phoenetic method, a fun and creative approach towards learning which makes reading a joy for a children. It is a well researched and effective English program ideal for children from the age of 4 to 12 years old (primary school level). A complete and systematic program with the objective of helping children to read English well from a young age. * Smart Reader® English Programme is one of the subject thought daily in our exciting Smart Reader Kids® preschool program to gain maximum exposure for the preschooler. English Tuition class size is 12:1. We maintain this small learning group per teacher to ensure kids get individual attention in each class. 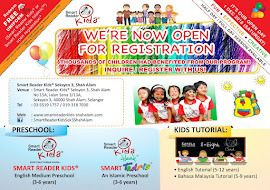 The monthly fees for Smart Reader® English Programme is RM80/month. Please contact us to learn more about Smart Reader® English Programme fee. This program prepares children to be a competent readers in English language by cultivating positive attitude towards reading using fun and creative approach. It lays a strong foundation in the application of English language so as to enable the children to speak with clear and correct pronunciation and to write confidently and creatively in English. Many children who has followed this program have achieved good communications skills and excellent results in their English Language examinations.